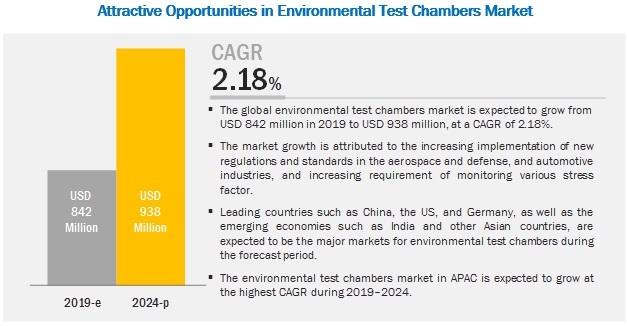 [138 Pages Report] The environmental test chambers market is estimated to grow from USD 842 million in 2019 to USD 938 million by 2024 at a CAGR of 2.18%. The major drivers for this market include the increase in number of regulations in industries such as aerospace and defense, and automotive; growing requirement of monitoring the effects of various stress factors; and supportive government initiatives. The temperature and humidity chambers are expected to hold the largest share of the environmental test chambers market by 2024. The environmental test chambers manufacturers majorly produce temperature and humidity chambers as a standard product or catalog product used for steady-state stability testing, basic temperature cycling, and accelerated stress testing of products or components associated with industries. A temperature and humidity chamber is essential for evaluating potential success or failure of a product in the field. The environmental test chamber market for the automotive industry is expected to grow at the fastest CAGR by 2024. Growing production of automobiles across countries is likely to raise the demand for testing capabilities for a variety of components including seat belts, electronics, airbags, engines, lithium-ion batteries, and so on. Testing of automotive components and automobile is carried out in testing laboratories and manufacturing centers to help manufacturers improve the marketability of their products and reduce costs in the preproduction phase. Thus, the automotive industry is likely to witness increasing demand for environmental test chambers during the forecast period. APAC is the major contributor to the total size of the environmental test chambers market. Many economically advanced countries have their manufacturing units in the developing economies of APAC, especially China and India. The domestic markets in APAC are growing rapidly owing to the rising per capita income among the middle class. Moreover, consumer awareness about the importance of quality products is growing in this region. Environmental test chambers play a major role in testing the effects of specified environmental conditions on biological items, industrial products, electronic devices/components, and materials. Thus, the demand for these chambers in most APAC countries is likely to increase in the coming years. Companies profiled in this report are ESPEC (Japan), Thermotron Industries (US), Weiss Technik UK (Germany), Binder GmbH (Germany), Cincinnati Sub-Zero Products, Inc. (US), Angelantoni Test Technologies S.r.l. (Italy), Memmert GmbH + Co. Kg (Germany), Climats (France), Russells Technical Products (US), Thermal Product Solutions (South Korea), Climatic Testing Systems, Inc. (US), Hastest Solutions Inc. (US), Hanse Environmental Inc. (US), CM Envirosystems Pvt. Ltd. (India), Envsin Instrument Equipment Co. Ltd. (China), Scientific Climate Systems (US), Presto Group (India), Bahnson Environmental Specialties LLC (US), Eckel Noise Control Technologies (US), and Konrad Technologies GmbH (Germany). June 2018, Binder launched the BINDER cell and module test chambers to evaluate aging and performance tests. It offers a high level of safety and maximum application convenience. The chamber is easy to use and meets Eucar/Hazard Level 4 specifications. June 2018, Memmert launched 2 temperature control appliances with climate-neutral CO2 as the refrigerant (R744) for ACHEMA 2018. In January 2016, ESPEC CORP. (Japan) completed the acquisition of QUALMARK CORPORATION (US), which provides manufacturing, sales, and after-sales services for HALT & HASS environmental test chambers. How is the adoption of the environmental test chambers evolving in various industries? What are the major strategies adopted by the key players to sustain in the environmental test chambers market? Which are the factors driving the environmental test chambers market growth? Which are the new industries for the use of environmental test chambers? Which region is expected to witness maximum demand for environmental test chambers? 10.2.5 Cincinnati Sub-Zero Products, Inc.
10.2.6 Angelantoni Test Technologies S.R.L. 10.2.11 Climatic Testing Systems, Inc.
10.2.14 CM Envirosystems Pvt. Ltd. This research study involves the use of extensive secondary sources—including directories and databases, such as Hoovers, Bloomberg Businessweek, Factiva, and OneSource—to identify and collect information useful for this technical and commercial study of the environmental test chambers market. Primary sources were several experts from the core and related industries and preferred suppliers, manufacturers, distributors, service providers, technology developers, and organizations related to all segments of this industry’s value chain. In-depth interviews with various primary respondents such as key industry participants, subject matter experts (SMEs), C-level executives of the key market players, and industry consultants have been conducted to obtain and verify critical qualitative and quantitative information as well as to assess the market prospects. Secondary sources referred to for this research study include corporate filings (investor presentations and financial statements); trade, business, and professional associations; white papers; certified publications; articles from recognized authors; directories; and databases such as International Confederation of Inspection and Certifications, European testing Inspection Certification System, and International Organization for Standardization. The secondary data have been collected and analyzed to arrive at the overall market size, which has been further validated through primary research. Extensive primary research has been conducted after gaining knowledge about the environmental test chambers market scenario through secondary research. Several primary interviews have been conducted with experts from both demand and supply sides across 4 major regions, namely, North America, Europe, Asia Pacific (APAC), and Rest of the World (RoW). This primary data has been collected through questionnaires, e-mails, and telephonic interviews. Top-down and bottom-up approaches have been used to estimate and validate the size of the environmental test chambers market and various dependent submarkets. 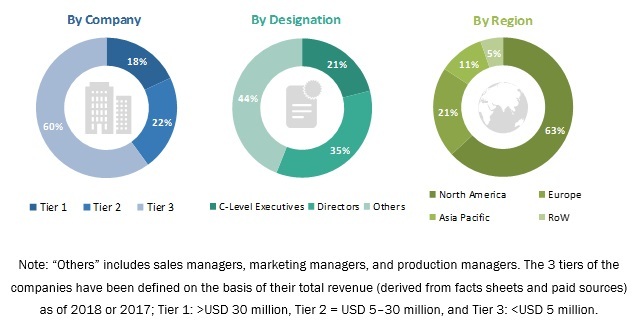 The key players in the market have been identified through secondary research, and their market share in the respective regions has been determined through primary and secondary research. This entire procedure involves the study of financial reports of the top players and extensive interviews with industry leaders such as CEOs, VPs, directors, and marketing executives. All percentage shares and breakdowns have been determined using secondary sources and verified through primary sources. All the possible parameters that affect the markets covered in this research study have been accounted for, viewed in extensive detail, verified through the primary research, and analyzed to get the final quantitative and qualitative data. This data has been consolidated and supplemented with detailed inputs and analysis from MarketsandMarkets and presented in this report. After arriving at the overall market size from the market size estimation process explained above, the total market has been split into several segments and subsegments. To complete the overall market engineering process and arrive at the exact statistics for all segments and subsegments, the market breakdown and data triangulation procedures have been employed wherever applicable. The data has been triangulated by studying various factors and trends from, both, demand and supply sides. In addition to this, the market size has been validated using both top-down and bottom-up approaches. The environmental test chambers market has been segmented on the basis of type, industry, and geography.